The holy grail of Mediterranean sailing is finding a deserted anchorage in paradise – azure sea, unspoiled island in the background, cocktail-in-hand, and the setting sun pouring out its gold onto the water. What a lot of photos can’t tell you is that the noise of the ship’s generator is echoing back to you from the rocky shore, and no one can hear themselves think! Not so with the Gulet Stella Maris. Gulets are large wooden sailing vessels native to Turkey. Anyone who has sailed the Aegean sea will have enjoyed the quiet timeless nature of the coastline, steeped in social history. 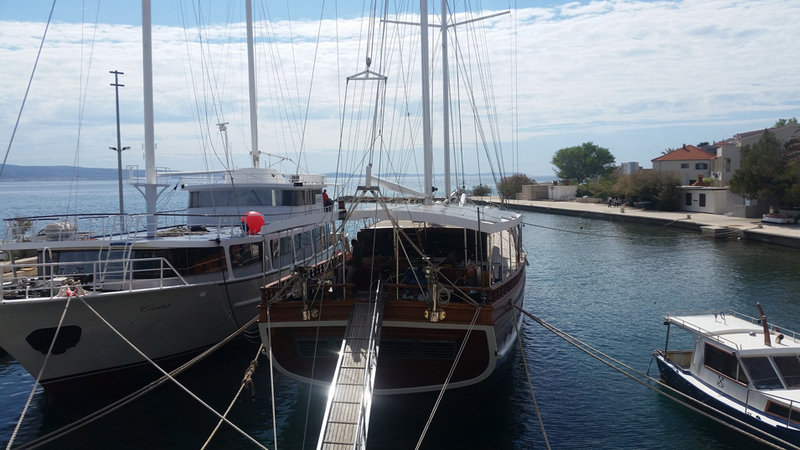 And sailing by Gulet is the best way to see it …the wind obligingly begins blowing soon after breakfast, and has finished for the day by tea time – long enough to waft you to your next silent anchorage. Even if you happen to arrive at your destination by motor, the growling of a generator in paradise is a travesty. Ante Lozic, owner/skipper of the beautiful vessel Stella Maris realised that he could offer his holiday guests complete paradise by avoiding the need for running a noisy generator whilst still being able to offer electrical on-board entertainment: a DVD/Music Player, Internet, charging facilities and all the usual domestic ‘mod-cons’ one expects such as refrigeration and pressurised water systems. In addition, a vessel of this size working commercially uses a considerable array of electronics for her safe navigation: She will have electronic charts, global positioning systems, radar, radio communications, weather and navigation information systems, together with real-time vessel identification/course/speed – and the norm is to have them working twenty four hours per day. The Stella Maris can accommodate 16 guests in 8 cabins, and is sailed by a crew of 7 – so the demand for power can be substantial. 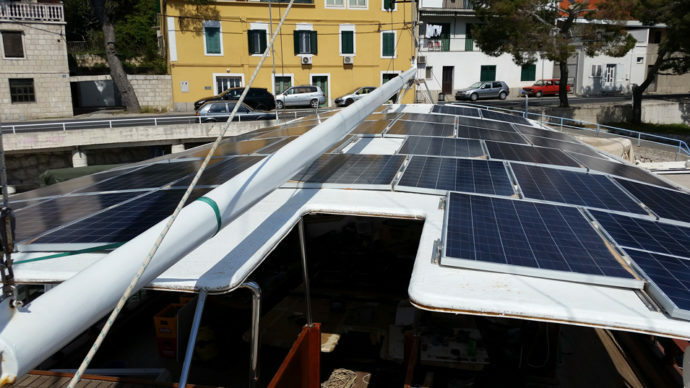 Skipper Lozic asked Boris Tudor, director of the remote energy specialist Solar Projekt d.o.o. to design and install a system which would provide ample power for guests without spoiling the beautiful appearance of his vessel. Solar Projekt, who have considerable maritime experience, came up with 10kWp system supplied from 34 Photovoltaic panels. discreetly placed on the vessels substantial awning – which provides shade for the guests – and is an ideal location for panels being almost fully exposed to the sun, yet practically invisible to the observer. …the panels are almost completely invisible to the onlooker. 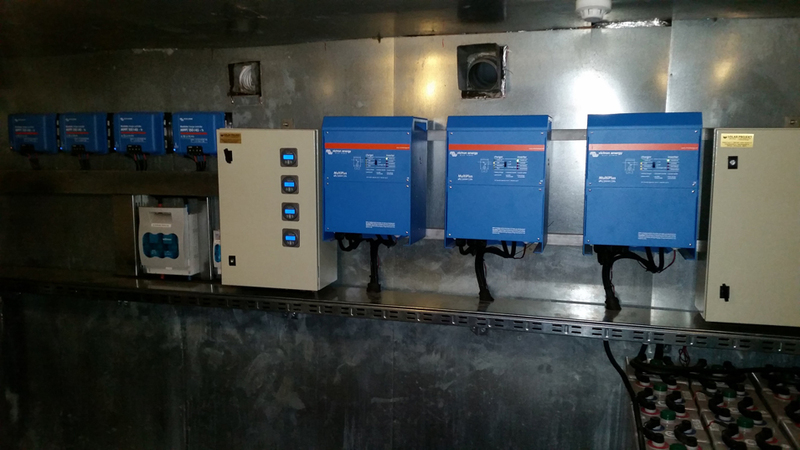 Four MPPT (150/45) maximise the solar energy obtained to charge the OPzV tubular plate battery bank. You can’t very well ask paying guests to be miserly with their power consumption in times of scarcity – hence the use of Tubular plate batteries which have a life expectancy of up to 20 years and can be cycled to 80% discharge, 1200 times. 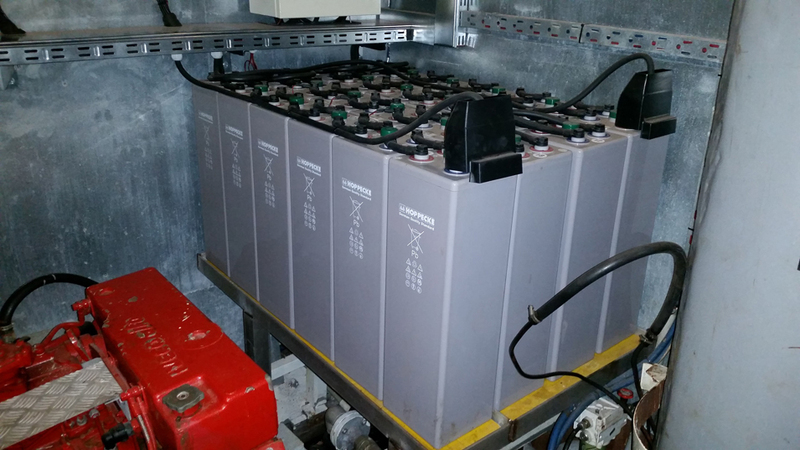 The batteries are also compact for their capacity – which even on a 38 metre vessel like the Stella Maris is important when you have 23 people living on board. 15 kVA of user-power is available from three Victron Multiplus inverter/chargers, which also allows for generator/shore power battery charging at up to 70A each from each unit. If you fancy a week or two floating on a turquoise mirror, cocktail in hand, surrounded by unspoiled scenery, lost in your own silent thoughts – it’s all waiting for you on the Stella Maris! Thanks to Victron Sales Manager for middle and eastern europe Leo Yntema for highlighting this interesting installation.